This instrument cluster of six gauges includes 22 telltales and a DEF level LED bargraph, sealed to IP67 for harsh conditions. The cluster features a large, versatile graphics display that acts as vehicle message center. The LCD display is heated for reliable operation and displays fault codes, diagnostics, and other data from the J1939 CAN data bus. The cluster is easily modified to fit any application, including various LED backlight colors, and is fully sealed. 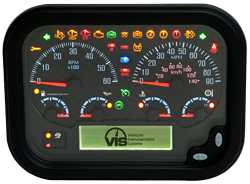 AMETEK VIS’ UIP-MC is part of the Universal Instrument Panel family that can satisfy the instrumentation requirements for all vehicle platforms. Easily customize the gauges, telltales and display to fit your application with minimal cost and time. The large, easy-to-read graphics display provides real time data information, diagnostics, fault codes, user set up features, and maintenance requirements. There are 22 LED telltales, along with seven gauge warning LEDs to alert the operator of existing conditions. One of the seven gauges is a bargraph gauge with four progressive bars that can satisfy the requirements of a DEF gauge. The green bars indicate the current level in 25% increments. Additionally the lowest bar can be changed from green to amber to red at customer specified values to alert the operator of low and critically low conditions. The cluster collects data from the vehicle J1939 CAN data bus, discrete switch inputs, and analog inputs. One of the J1939 CAN inputs can also be used as a J1587 data bus input. Optional external NGI gauges can be added to the system. Backlighting color is white, with green, red, amber or blue as optional. UIP-MC provides an optional eyebrow for direct sunlight applications. UIP-MC is sealed to IP67 specifications both front and rear. Designed to withstand harsh conditions typical of off-road environments, the UIP-MC meets all SAE J1455 and J1113 requirements for vehicular instrumentation.